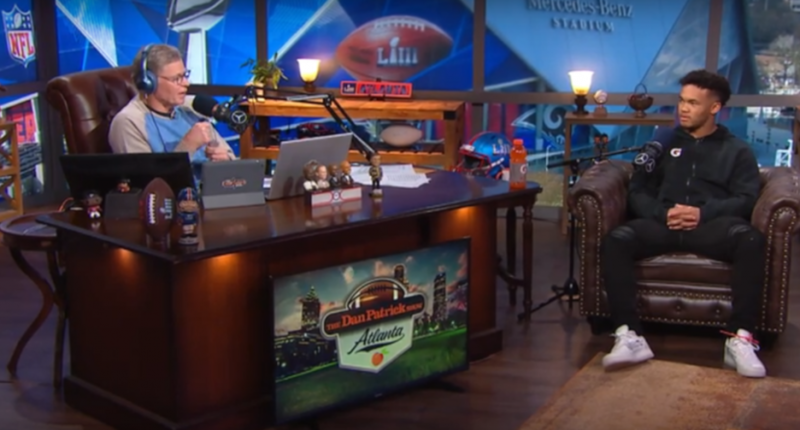 DAN PATRICK: Are you going to the combine? KYLER MURRAY: [long silence] I dunno. PATRICK: Uh—Dad, is he going to the combine? KEVIN MURRAY: [offscreen] No comment. PATRICK: Dad had no comment there. Pro Day? MURRAY: I mean, that’s after the combine. …PATRICK: When do you report for the Oakland A’s? PATRICK: Ooh, you knew that. Okay. So you’re ready to go to do that. PATRICK: Wait, are you going to spring training? MURRAY: [Laughs] I don’t know. PATRICK: You don’t know?! Dad, is he going to spring training? Another no comment here. You know, these microphones are on right now. There are a whole lot of weird things there, and even more in the full interview (yes, this somehow went on for over 13 minutes). And the weirdness seems to be on Murray’s end. He of course doesn’t have to reveal which sport he’s choosing (and a lot of this seems to indicate him still trying to play both sports professionally, a la Deion Sanders) at this point, but he definitely should have known that most questions in a radio interview would revolve around that, and he probably should have had better responses ready to go. Even just quickly saying “I haven’t decided what my next steps are yet” would have been better than the “I dunnos” and long silences. And Murray wouldn’t have had to commit to anything to at least be an interesting interview. He could have filibustered the “Are you going to the combine?” with a longer response along the lines of “I’m considering it, but I haven’t decided yet, because I love football, but I also really love baseball, and I’m hoping that I can find a way to do both.” It’s quite possible to give responses that relate to the question, take up some time and offer a few potential quotes without actually committing to anything: politicians do it every day, as do many athletes, as do most sports media executives (especially when appearing on a panel or a conference call). And if Murray was willing to do this interview, it might have made sense for him to think about how to handle the obvious questions. Or if he didn’t want to do that, he could have just not bothered doing interviews this week. There are of course some parallels to Marshawn Lynch’s famed “I’m just here so I don’t get fined” filibuster at the 2015 Super Bowl, but there’s one key difference. That was at a Super Bowl media availability, where all players were forced to show up without financial remuneration, and with penalties if they dodged it, so there was some merit to Lynch’s approach of cleverly fulfilling the letter of the law without saying anything in particular. Meanwhile, Murray is choosing to do media appearances as part of an endorsement contract, so there’s a little more reason to think that he should be willing to talk. And even if he doesn’t want to reveal his professional future right now on someone else’s show, he could do better at finding ways to answer questions that are clearly coming. Meanwhile, the other extreme of the day for Patrick saw an athlete who was being perhaps too candid in ways that compromised the sponsorship he was there shilling for. In a spot for SleepNumber, Minnesota Vikings’ quarterback Kirk Cousins kept talking about…all the trouble he had sleeping this year. From the media side, most will take a too-revealing interview over a not-revealing one any day. But this still was another part of a strange day for Patrick.